Impact fees are one-time charges that are applied to new residential developments by local governments that are seeking funds to pay for the construction or expansion of public facilities, such as water and sewer systems, schools, libraries, and parks and recreation facilities. In the face of taxpayer revolts against increases in property taxes, impact fees are used increasingly by local governments throughout the U.S. to finance construction or improvemof their infrastructure. Recestimates suggest that 60 percof all American cities with over 25,000 residents use some form of impact fees. In California, it is estimated that 90 percof such cities impose impact fees. For more than thirty years, impact fees have been calculated based on proportionate share of the cof the infrastructure improvements that are to be funded by the fees. However, neither laws nor courts have ensured that fees charged to new homes are themselves proportionate. For example, the impact fee may be the same for every home in a new development, even when homes vary widely in size and selling price. Data shows, however, that smaller and less costly homes have fewer people living in them and thus less impact on facilities than larger homes. This use of a flat impact fee for all residential units disproportionately affects lower-income residents. The purpose of this guidebook is to help practitioners design impact fees that are equitable. It demonstrates exactly how a fair impact fee program can be designed and implemented. 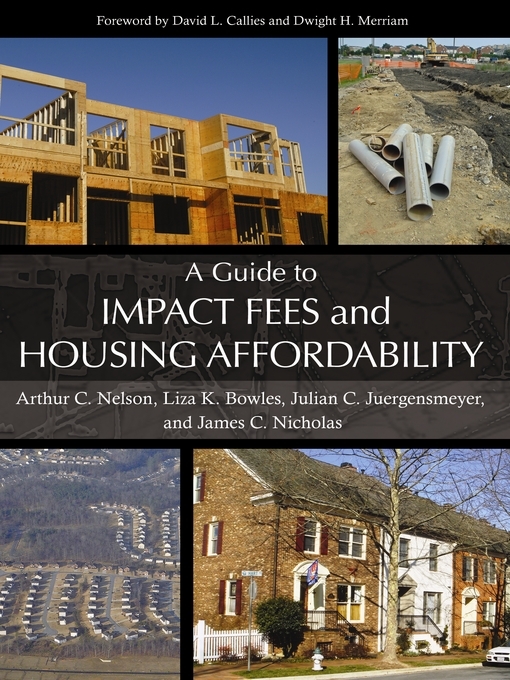 In addition, it includes information on the history of impact fees, discusses alternatives to impact fees, and summarizes state legislation that can influence the design of local fee programs. This book should be the first place planning professionals, public officials, land use lawyers, developers, homebuilders, and citizen activists turn for help in crafting (or recrafting) proportionate-share impact fee programs. Craig Anthony Arnold - Author of introduction, etc. Dwight Merriam - Author of introduction, etc.